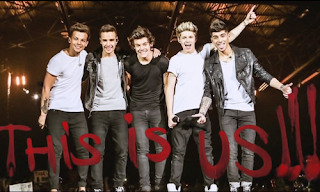 Like many a recording star before them, One Direction will make their U.S. film debut this weekend. It certainly isn’t a new concept for recording artists to step off of the concert stage and onto the silver screen. In the past such stars as Elvis, Frank Sinatra and Will Smith successfully transitioned from music maven to movie mogul. More recently we've seen the likes of Justin Timberlake, Katy Perry, Selena Gomez, Beyonce, Justin Bieber, Jennifer Lopez, 50 Cent, Britney Spears, Rihanna and Eminem take to the camera like Miley Cyrus to twerking. Since One Direction: This Is Us is a pop-umentary it didn’t afford the boys an opportunity for dramatic acting. But, who knows where their first theatrical release will lead them. Whoever thought Mariah Carey would be nominated for a Screen Actors Guild Award after “Glitter”, or that "Fly Girl" Queen Latifah would go from Grammy's to Golden Globe and Oscar Nominations! And whoever thought Jennifer Hudson (another music reality show cast off, like 1D) would take home an Oscar?! What we do know is those faithfully obsessed Directioners will turn out in droves and make One Direction's first film a hit and very possibly break box office records. While 1D is breaking records in the cinemas I'll be breaking records In The Mix with HK. Seriously, I've got a bevy of brand new eargasms and banging beats for a Labor Day weekend throw down you don’t want to miss. Check your local listings to peep out my non-stop commercial free music sets all weekend long! KE$HA AND MIKE POSNER GET CRAZY! SHERYL CROW, THE SUMMER SET AND HK GLAM IT UP!